For years, Anne-Sophie Mutter has been performing together with various scholarship students of her foundation – in order to familiarise them with the life of a professional musician and to introduce them to a broader audience. In the spring of 2011 she started the additional project The Mutter Virtuosi: this ensemble under the violinist’s artistic leadership consists of current and former scholarship holders of the Anne-Sophie Mutter Foundation as well as selected other young musicians. On their tours through Europe, North America and Asia, the Mutter Virtuosi regularly introduce their audience to new works; benefit concerts are also a fixed part of every tour programme. Furthermore, the soloists’ ensemble can now be heard on recordings and video. The first tour in 2011 featured stops in eleven European cities. The programme included Mendelssohn’s Octet for Strings Op. 20, Vivaldi’s “Four Seasons” and a work commissioned by the Anne-Sophie Mutter Foundation from Krzysztof Penderecki, “Duo concertante per violino e contrabbasso”. The concert programme of the tour through Asia in 2013 once again included the classics by Mendelssohn and Vivaldi – and a new commission from the Anne-Sophie Mutter Foundation: on June 6, 2013 the violinist and the double bass player Roman Patkoló gave the world premiere of Sebastian Currier’s “Ringtone Variations” in Seoul. November 2014 saw the next tour of Anne-Sophie Mutter and her Virtuosi. They performed seven concerts in Canada and the USA, including at New York’s legendary Carnegie Hall. 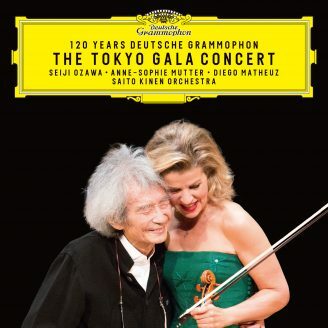 The Anne-Sophie Mutter Foundation’s commission “Ringtone Variations” and Previn’s Violin Concerto No. 2 were first performed in American concert halls. The tour repertoire also included the Bach Double Concerto for Two Violins, the Mendelssohn Octet and Vivaldi’s Four Seasons. Two benefit appearances framed the North American tour.